“Hey, Andrew, can I tell you something?” Even at 5:30 when we’re all tearing down, packing up and getting ready to head home for the evening, this hits my ears like a melody. Andrea Benitez, a highly inquisitive and musically gifted 7th grader, is someone I always have time for. Without hesitating, I nodded my head and took a seat to give her my full attention. Andrea adjusted her glasses and spoke confidently. “Well, I was in my room practicing last night…” She was already off to an excellent start. Perfect practice is one of the habits of a great musician that we’ve preached since the beginning of the year. I was hooked. “I found a bunch of the old charts we used for the Christmas concert, like ‘Jingle Bell Rock’ and ‘Feliz Navidad’. And I looked at them, and I felt, well…” She had me on the edge of my seat, and I nearly fell off of it when she continued: “…a little embarrassed.” Embarrassed. Talk about a brow-scruncher. I could understand if she had felt proud, accomplished, even nostalgic—yes, I believe 7th graders are capable of feeling nostalgic. But embarrassed?! I was shocked. I had to know more. Being the perceptive and empathetic 13-year-old she is, Andrea spotted my confusion right away. She giggled, as if to cut the tension. “No!” she assured me. “It’s not like that! Seeing all those old charts just reminded me of how overwhelmed I felt when we learned those songs, and how it took me days of practice to feel confident playing them. I remembered how nervous I was when I sang ‘Feliz Navidad’ for the first time in front of people. It’s just kind of hard to believe that I ever felt so weird about playing music for an audience.” This made my brow scrunch even further because in my mind I was time traveling back to early December, inside the gym at Evergreen Academy Middle School, where our first real gig took place. Andrea did feel nervous that day, but I wouldn’t have known it if she didn’t tell me herself. On the outside, she was calm, collected, focused—everything a great musician should be before playing her first real gig. The band had labored through a few assorted Christmas songs as well as a version of Counting Stars by OneRepublic; ‘Feliz Navidad’ was our finale. 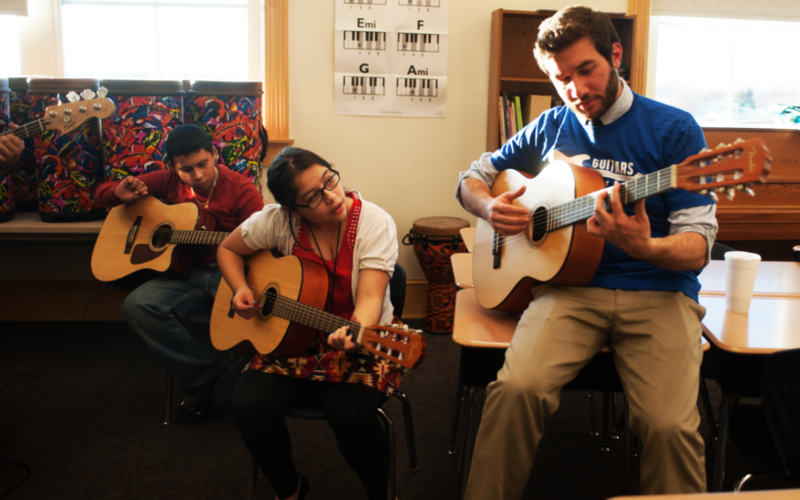 Andrea was playing guitar and singing lead vocals, a goal she had been working toward since October. She had just launched into the melody of the first chorus when, suddenly, all I could hear was the band backing her up. This was particularly strange, because Andrea’s mouth was still moving. I could suddenly see her eyes start to widen as she realized her microphone had just decided to stop working—her vocals almost completely drowned out by the ambient gym. Slowly, student spectators began to turn to one another and chatter, and the band took notice. From the back of the room, I watched anxiously as Andrea’s gears turned. The window of opportunity to win back her audience was small, but open. She never once stopped singing. She did, however, stop playing for a brief moment to raise her hand in the air, to invite the crowd to join in. Before the end of the second chorus, an entire gymnasium full of students was singing, loudly and proudly, I wanna wish you a Merry Christmas! It couldn’t have gone over more seamlessly if we had planned it. Within a matter of seconds, our students showed their collective strength & intellect, patience & resilience, and an unparalleled belief in one another—that kind of experience is monumental for group culture. We were sure to celebrate the effort and lightning-fast thinking of the band in our next rehearsal. Was that really only five months ago? I had to ask myself because so much had taken place since then: Since our first real gigs, we’d performed upwards of ten more times in and out of school, and been spotlighted for our work in several local news publications. We’d visited—and laid tracks in—a professional recording studio, and created a music video documenting the experience. We’d taken a private tour of the Chicago’s House of Blues. The kids loved spotting the names of renowned entertainers who had written and carved their autographs onto the storied green room walls. In class, we created our own practice protocols and a set of values we want to live by; we challenged ourselves to try new things, take risks & learn new songs in record-time; we identified section leaders and engaged in peer-to-peer practice; we tackled the songwriting process, performed and taught one another original music; we set goals for ourselves, shattered some with ease, came up short and learned from others; we prioritized becoming better musicians, and better people. We had grown. And that’s tough to recognize in real-time. Andrea, however, found a way in that moment to put what had otherwise been a fast-paced, action-packed semester on slow-mo, and really highlight her personal and musical growth. Reflect, we tell them. Celebrate yourself and others. Learn from your experience. This time, a student was doing all those things without prompting. The only embarrassing thing about it was how long it took me to realize it myself. How fortunate am I that a 13-year-old kid from McKinley Park was astute enough to recognize this, and giving enough to share in it with me?